In 1971, I spent the summer in the USSR, improving my Russian language skills. Since that time, the Cold War has ended, but the cupolas of the Russian churches are still standing, and folks still like to grind pepper at the table. 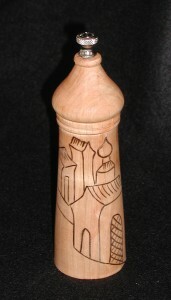 I made this 7″ tall pepper mill after watching Nick Cook turn one at the Desert Woodturning Roundup in February 2009. The architectural drawing is derived from the way Russian icon painters depicted space without perspective. My drawing teachers told me that I lack good depth perception, so this is my kind of ornament.